Season Premiere: The cultural touchstone in 2013’s debut episode of The Americans was Fleetwood Mac’s “Tusk”; in the Season 2 opener, it’s the Meryl Streep tear-jerker The French Lieutenant’s Woman—we get it; it’s still 1981. With Elizabeth’s (Keri Russell) gunshot wound and marriage on the mend, it’s time for her and Philip (Matthew Rhys) to return the field and the business of bringing down American for Mother Russia—but is she off her game? A terribly botched first mission back says da. Meanwhile, Stan (Noah Emmerich) continues to be played by now-double-agent Nina (Annet Mahendru), who doesn’t appreciate the sentiment of The French Lieutenant’s Woman at all. 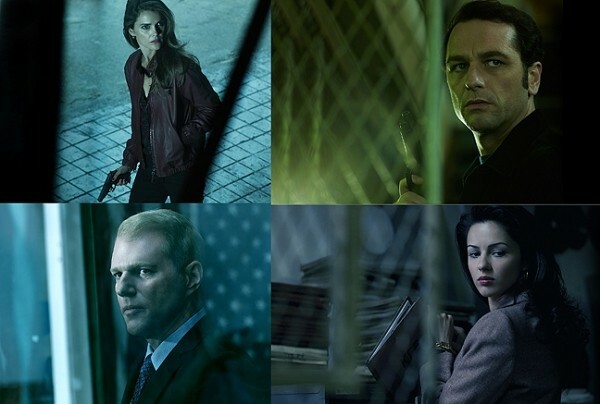 By the end of Season 1, The Americans proved it was more than a retro Homeland, and Season 2 looks to go even deeper—Brody who? Series Debut: We’re going to need a ruling on the definition of “Private,” here—does it mean, “Followed around by a camera crew capturing every calculated second of our scripted ‘Lives’ ”? Don’t expect an answer from TNT anytime soon, because they’re floating obliviously in an alternate timeline when this catty Housewives crap is still viable, not realizing that just injecting “Nashville” collagen doesn’t instantly make them Bravo circa 2008. Of all the cable nets chasing a quick buck with reality-TV filler, none get it more consistently wrong than TNT. Can’t they just be happy with Rizzoli & Isles? Series Debut: AMC hasn’t had much luck with reality outreach, either—but at least their offerings have been original and interesting (c’mon, who wasn’t simultaneously intrigued and horrified by Small Town Security?). Game of Arms, about the sleeveless lives and sweaty struggles of competitive arm-wrestlers, strikes a winning balance of colorful characters and semi-genuine drama that at least feels worth rooting for, in the same weird fashion you may have cheered on IFC’s Whisker War-riors, or Olympic curlers. Problem is, AMC should have slotted GoA on Sundays after The Walking Dead/Talking Dead block, instead of attempting to launch a whole new night with it on Tuesdays. Kevin Smith must have some serious extortion goods to keep Comic Book Men alive. Series Debut: Speaking of heartwarming, how about a Christian Slater/Steve Zahn dramedy about a human-behavior expert (Zahn) and his ex-con brother (Slater) who form a team that uses trickery and “Jedi mind tricks” to bend the will of Big Bads (like, say, insurance-company heads) to the benefit of their downtrodden, salt-of-the-earth clients? Sure, Leverage did it with more style and fewer warm-fuzzies for years, but that’s canceled—this is where we are now. Slater and Zahn make an effortless, charming duo (and the rest of the cast mostly keeps up), but Mind Games is either going to have to go edgier or sweeter to stick. ABC already has a show called The Middle.